I took this photo while on an evening walk a few weeks ago. I hadn't been on a walk for such a long time, and it was really starting to depress me. So, I decided to take a quick walk down the road in an attempt to capture the sunset. I was too late to capture the sunset, however. I did manage to capture this deer who was standing there watching me have a conversation with one of my and Hub's friends who was driving down the road. He was actually headed to my house to help Hubs. No, he wasn't going to tell him about diets for quick weight loss; He was coming to help with a calf we had in our basement... a rather loud calf at all hours in the night and morning, I might add. Before the friend pulled away to go find Hubs, he laughed when he saw the deer was just standing there watching us. 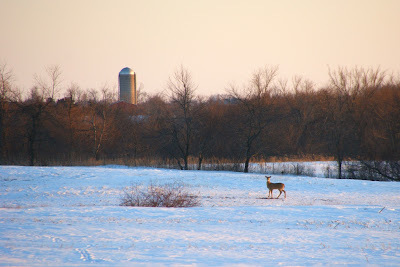 I realize it's not a great photo, but I like the whole farm scene it portrays with the field, the deer, and the silos in the background. Wow..that's a gorgeous photo! The lighting and background are just awesome! Happy weekend..
A beautiful photograph as always. It reminds me a lot of our area. A lovely picture, it captures the feeling of country living. Misty: It is always wonderful to see a deer in the wild. Great shot! The scene is very relaxing! My Camera Critters post, have a nice Saturday morning. Pray tell, how do we contact an Administrator to correct an incorrect link? Instructions are there, but no names? I made an error in #23 which should be deleted since it is the wrong address. Thanks for the help! A critter I am never going to see here unless in the wildlife park. Wonderful. Misty -- it's a gorgeous photo ... the deer, the background, the snow ... beautiful! Lovely photograph - such crisp, clean air or so it looks. I always get such a thrill seeing deer. Wonderful shot of the deer and countryside, Misty! Nice image, Misty. With those ears, the deer was probably wondering why you were talking so loud...hehehe. I just love the country scenery. Such a pretty view you have. It is a good photo, the snow sets it off, could be a painting, here in Iowa we have seen enough snow, woke up to 3 inches this AM, I want spring and green, green. Thanks for doing Camera Critters. I think it is a great photo! The deer was probably just shy and trying to work up the courage to come over and join the conversation. Yeah, that's it. Calf in the basement? Who keeps calves in the basement?